Race, as we use the concept today, applies arbitrary divisions on the wide diversity of human physiology. The fact that these divisions are arbitrary does not make them irrelevant or innocuous. As with many other ways of dividing up humanity, race has often been used to justify inequalities. The ancient Mediterranean world was not free of inequality or arbitrary divisions between people, but that does not mean that those divisions worked the same way as the modern idea of race. Skin color is a useful place to start. Although many different aspects of human physiology have been used to mark out racial divisions—face shape, hair texture, skeletal proportions—none is more thoroughly interwoven into racial ideology as skin color. The terms black and white are conventional ways of identifying race. Others, such as red, yellow, and brown, though not as widely used as they once were, still appear today, sometimes with more complex meanings than they once had. Even the currently preferred circumlocution people of color still supposes that skin color is a prime marker of identity. In both life and art, we tend to look at skin color as the signal marker of racial identity, and to identify both ourselves and others in those terms. What did skin color mean to the people of ancient Greece and Rome? It was not irrelevant. 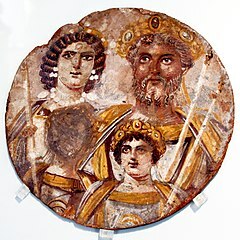 Greek and Roman authors and artists were aware that different people had different skin tones and they sometimes connected these distinctions with identity in significant ways, but that is not the same as recognizing race. We cannot read ancient literature or look at ancient art and evaluate it the same way we would treat at a modern movie or news story. I don’t try too hard to please you, Caesar. I don’t even know whether you are a black person or a white person. To a modern Western audience, this sounds at once like a reference to race. To call someone a “black person” or a “white person” today is transparently and unambiguously a racial identification. Yet Catullus meant nothing of the kind. He certainly was not ignorant of the ancestry and identity of one of the most powerful people in the Roman world in his day. In Classical Latin, “I don’t know whether it’s black or white” is a common saying meaning “I don’t care in the slightest.” Catullus wasn’t talking about Caesar’s skin color at all. Athena pointed with her golden wand. and spread a tunic around his breast, filled out to its prime. and a dark blue beard covered his chin. The word used to describe Odysseus’ color, melanchroiēs, can be literally translated as ‘black-skinned,’ but really means ‘deeply suntanned.’ The darkness of Odysseus’ skin is important because it marks his age and experience. It was not part of an ethnic identity he was born with but something he acquired through experience. and said we should hand the city over to the women. Nikias was a prominent politician of the age who championed the cause of peace between Athens and Sparta. Just like Odysseus’ “black skin” was a marker of his long career as a warrior, Nikias’ “whiteness” distinguished him as a military dilettante. In neither case was the color of their skin meant to convey a racial identity. It seems that even at a basic level, ancient Greeks and Romans described colors differently than we do today. Latin has two words for both white and black. Albus means pale, lusterless white, while candidus means bright, gleaming white. Ater is flat, matte black while niger is glossy black. In Greek literature, many objects are described with colors we would not associate with them today: wine is black; grass is white; honey is green; iron is blue. (Note also Odysseus’ “dark blue” beard.) When ancient authors describe people in terms of color, we must be particularly cautious in how we interpret them. Ethiopians say the gods are dark and snub-nosed; the Thracians give them red hair and blue eyes. The physical variety [of the Britons] is suggestive. The golden-red hair and burly limbs of the Caledonians shows them to be of Germanic origin. The colorful faces and curly hair of the Silures, plus their position opposite Spain, suggests their ancestors were Spaniards who came across the ocean. These observations should both caution and stimulate us. On one hand, we cannot simply read ancient sources—or their modern translations—the same way we would read modern texts. Ancient Greek and Roman authors did not think in the same racial terms we use today, and we risk misunderstanding them if we simply apply modern concepts to ancient texts. When we read that the Greek historian Herodotus described the people of Egypt as “black” (Histories 2.22), the question we have to ask is not “What does ‘black’ mean?” but “What did ‘black’ mean to Herodotus?” Like Homer describing Odysseus, he probably meant that they were deeply tanned. He could not have meant that they belonged to the racial category of people we today classify as black because Greeks of his day did not use the word black with that meaning. Quite simply, Herodotus tells us nothing of much use in assigning modern racial categories to the ancient Egyptians. On the other hand, the fact that ancient authors did not generally use skin color as a way of distinguishing racial groups in the same way we do does not mean that the ancient Mediterranean was ethnically homogeneous. Greek and Roman authors described the world in the terms that mattered to them. They had no idea that we would be coming along a couple of millennia later asking different questions with different ways of describing ourselves. Absence of evidence is not evidence of absence: the fact that ancient authors tended not to describe people’s ethnicities in terms of skin color does not mean that people of many different ethnic origins and skin tones did not live among them. Race is a clumsy and historically fraught way of dividing up the rich complexity of human diversity. Just because ancient Greeks and Romans didn’t divide people up in the same way we do doesn’t mean that the world they lived in was any less complex than our own. If we want to find evidence for that diversity, we have to be prepared to look for it in ways that don’t depend on modern conventions.